By means of an electronic counter connected to an old computer the times and time were registered that a bird flew in and out of a nest box. The birds are registered entering and leaving the nest-box. This would mean that the registrered data are approximately twice as high as the nestlings are tended by the parents. Because of the accuracy of the counter a lower bound of 4 seconds in the registration was necessary. This avoided a lengthy file filled with data only hundreds of a second apart. But bluntly dividing the registrered data in two to get the correct registration of visits would result in another deviation of the truth. During the nestling period the time spent in the box reduces all the time. At first both parents will enter the nest box and leave in about 35 to 30 seconds. Later on the opposite occurs namely they stay out of the nest-box about 35 to 30 seconds. At the end the parents will not enter the box itself at all. To adjust this variation in behaviour we introduced a threshold value that would vary with time. After registration the data file was translated into a database file. With this translation also the threshold value was entered. Now only those recordings were translated into the database file that were the threshold value apart. This would result in only one registration per feeding. The threshold value will be 35 seconds at the start of the incubation period and 0 at the end of the nestling period. I realize that now other mistakes are made. 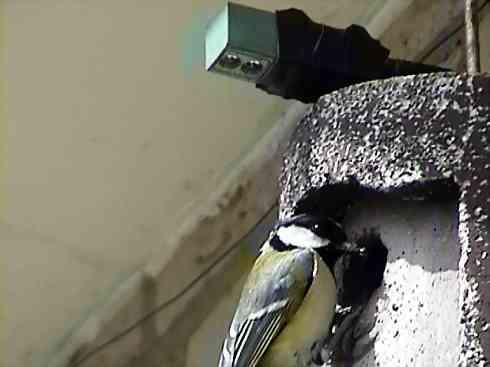 For instance if both parents enter the nest-box shortly after each other. In this case the second parent will be ignored in the recordings. The only alternative would be to observe the nest-box manually. This is no alternative for a non professional in this field. Also the few recordings that I made at night would be missed. I have made these recordings now since 1989 and one can have a good idea of how many times the nestlings are fed per day and at about what time. Improvements both in the approach and in the programmes will make the conclusions more reliable. Here you can see some results. The figure shows the number of visits by the parents. The blue line is the trend-line. The first brood (5 nestlings) shows a great difference with the second brood (3 nestlings). 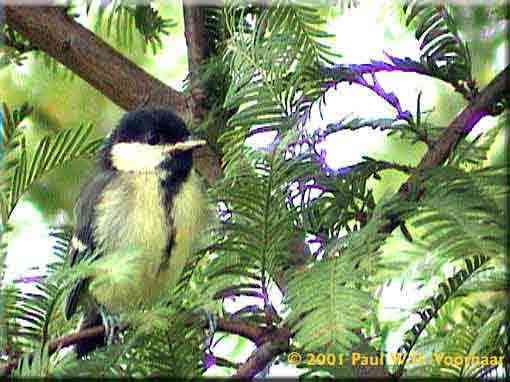 The first brood has a higher frequency in feedings. With the second brood the daytime lasts longer and the feeding time lasts longer but less frequent. The parents more than once continue feeding during the night. We calculated the feedings per hour as a percentage of the total number of feedings. Now the difference of the first brood with the second brood becomes more clear. Although the number of fletchlings and the number of feeding differ a lot, the trend line has more or less the same shape. The number of feedings during the hottest time of day are less in the second brood. This is compensated by the number of evening and night feedings. Also there are less feedings in the second half of the day compaired with the first brood. I think that if the threshold value is adjusted more accurately, the end results will improve. For now I will continue making these recordings the way I have done in the past. However all of the original registrated data are kept for future use. If someone has a fair idea about what improvements can be made with this approach. I will be grateful in receiving this information. -->You need Java to see this applet.